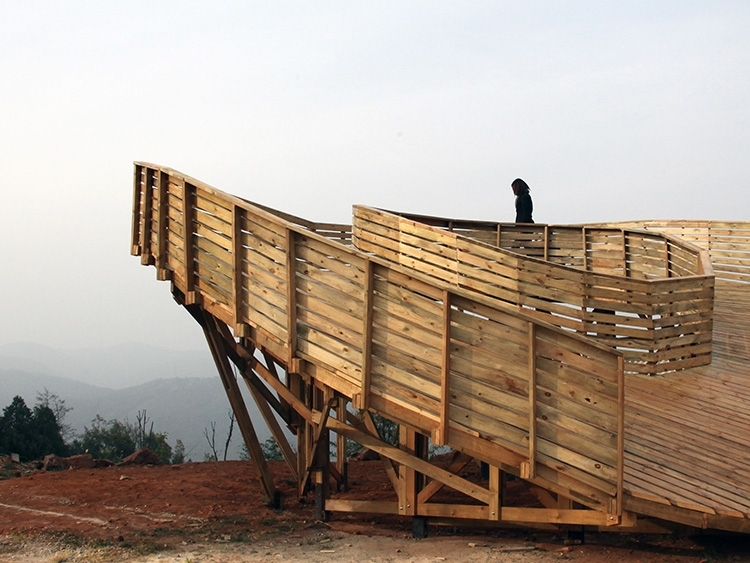 THE SWEEP is a viewing platform and play area built in a Bai minority village in Yunnan Province. Conducted as an experiential learning project in the Department of Architecture at The University of Hong Kong, the project was built in 6 days with 65 students. The timber structure is designed as a series of 12 trusses arranged tangentially into a self-reinforced ring. Each truss cantilevers up to 4 meters to support a decked surface. As the trusses descend and ascend, the ruled surface evolves from the ground upward, culminating in a spectacular view across a valley of rice terraces. The project is located at the entrance to the local primary school. Students live in the school on weekdays and are picked up by parents for the weekend. The platform is a natural waiting area for parents and students, offering a shaded space below. Though the plan arrangement of trusses is simple, the overall structure delivers a diversity of views and spaces, constructing a 360 degree panorama of village houses, mountains, valley, and farmland.